The Doulton Sterasyl is a highly efficient ceramic micro filter which provides genuine sub micron filtration of drinking water. Sterasyl is manufactured with the highly consistent and controlled pore structure necessary to remove a wide range of water borne contaminants over the life of the candle. In addition to fine particulate matter, bacteria, cysts and turbidity are removed to a high level of efficiency. 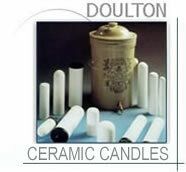 The incorporation of silver locked within the ceramic structure inhibits the growth of bacteria and gives each candle enhanced bacteriostatic and self sterilizing properties for safe handling and cleaning. Most chemical contaminants can be reduces by the means of a carbon filter (GAC, compressed or extruded block form filters). Activated carbon filters are not to be relied on virus and bacteria reduction in fact, if not changed often they can become a breeding ground for bacteria. While iodine is still the most effective chemical treatment against virus and bacteria however it is virtually useless against protozoa like amoebae, giardia and cryptosporidium. If ingested over an extended period of time it can be harmful to your health. Chlorine is used in many countries for the treatment of drinking water. It is a known fact that chlorine will react with organic matter in the water to form the cancer causing thihalomethanes (THM's). Just like iodine chlorine is not effective in killing protozoa. They will both decompose quickly and can not offer a long term protection. Capabilities With a wide range of contaminants removal capabilities such as; total dissolved solids (TDS), THM, THMs, trihalomethanes, chloroform, chemical pollutants, heavy metals, lead, whole house filtration, pollution, chlorination, chlorine, fluoridation, fluoride, volatile organic compounds (VOC's), herbicides, pesticides, asbestos, arsenic, antraz, turbidity, ecoli bacteria, E.coli, amoebae, giardia and cryptosporidium, viruses and many other water pollutants. 2"x10" with 3/4in. (19mm) threaded mount for British Berkefeld gravity filters, Doulton filters and Katadyn™ Ceradyn™ filter (requires 3). Please specify in shopping cart text area when ordering for gravity filters which will include wing nut. *Designed for British Berkefeld™ housings, they will also fit Katadyn™ TRK Ceradyn™, Gravidyn™ and other gravity filter housings.